I love those tiny oval oranges, that taste more like bitter orange (orange amere) than a regular orange since you can eat the peel, the bitterness comes from the peel so you get a stronger “orangy” flavor than regular oranges. They originally come from Malaysia or China and can be grown in pots but need to be protected from rough colds or very low freezing temperatures. They’re mainly used in jams, chutneys, or in sweet-bitter sauces, but also in pastries. I generally make pork tenderloin with them that turns out to be a quite flavorful and delicious dish served with a fennel/potato puree. I had some leftover kumquats that I didn’t use in my pork tenderloin recipe this weekend and I was wondering what to make with those other than jam. Since most of the fruits are perfect for chutney, I thought kumquat chutney would be great to have with grilled meats, or to enhance any rice dish. 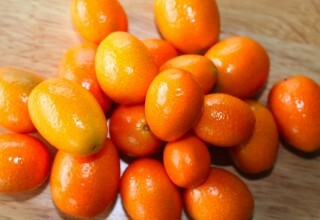 Cut the kumquat in small pieces. Chop the onions, crush the garlic, and grate the ginger. In a pot, add olive oil and brown the onions until cooked and translucent, for about 15 min at medium heat. Add ginger and garlic and cook for another 5 min. Add sugar and stir for one minute or so. Then add kumquats and all other ingredients. Stir and cook until the liquid evaporated and the mixture thickens. Let it cool, put in a jar and refrigerate. This chutney can last for about one month in the refrigerator. This entry was posted by silvia on February 17, 2009 at 10:04 pm, and is filed under Sauces and condiments, Vegan. Follow any responses to this post through RSS 2.0.You can leave a response or trackback from your own site. Awwww….I love kumquats. It’s not in season yet. I usually pickled it with sugar and eat them just like that….utterly delicious! Great to eat with fingers….the syrup that drizzles….finger-licking gd…mmmm. Just forget abt high sugar & diabetes. 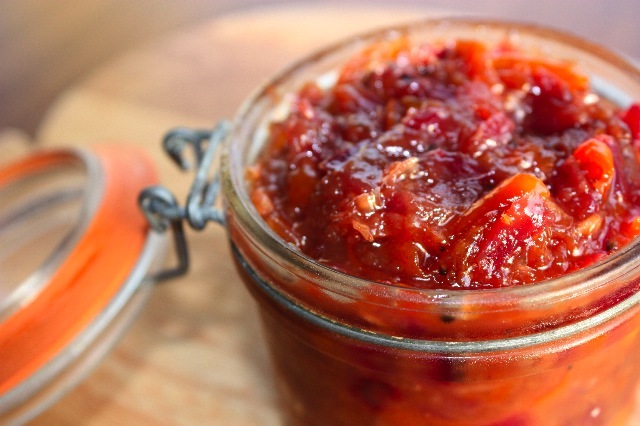 What a lovely chutney recipe! This sounds so tasty, particularly with the ginger and star anise. I can think of one thousand ways I could use this. Oooo….the colour looks so attractive! I bet it’s as tasty as it looks. I don’t take this very often. So, how do you eat this? With bread or salad..??? Congrats on top 9 today! I grew up with these little sour/bitter citrus all over my neighborhood but we never really ate them, what a shame. They are so flavorful. This chutney sounds delicious. I am inspired. The pork with fennel and kumquats sounds divine too! The home loans are essential for guys, which would like to ground their organization. As a fact, that’s comfortable to receive a car loan.